GovHack is one of the largest hackathons in the world, bringing government, entrepreneurs, coders, designers and innovative thinkers together to propose new ways government can reuse these ideas to service the community. Open Data Challenge was this year’s focus and each team had to come up with an idea, create, pitch and present their ideas to a panel of judges. Check out the QGCIO IT Graduate Program teams Take Me Anywhere – Don’t just search for a Job search for adventure App. 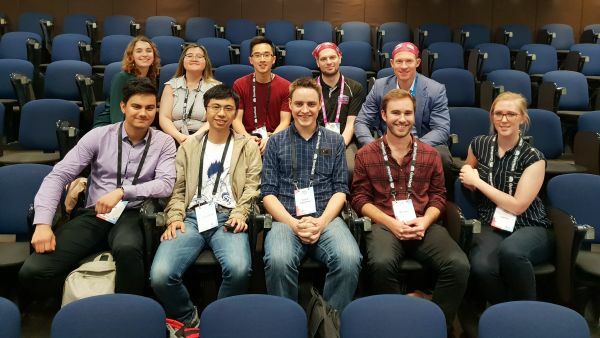 Front row (L-R): Arjai Reynolds (DET), Frank Wang (QAO), David Sweeney (Health), Michael Dobrijevic (QSuper), Lauren Tilley (CITEC), Back row (L-R): Lauren Wilson (QGCIO), Alice Huynh (QSS), Xavier Huang (CITEC), GovHack coordinator, Minister Mick de Brenni.